Aminah lives an idyllic life in the village of Botu, until she is brutally seperated from her home and forced on a journey that will turn her from a daydreamer into a resilient woman. Wurche, the wilful daughter of a chief, is desperate to play an important role in her father’s court of Salaga-Kpembe. The lives of these two remarkable woman converage in a tumultuous meeting that takes them from mistress and salve to unlikely allies, as Aminah and Wurche find themselves tangled in a web of desire, jealously, political intrigue and illcit affairs. Meanwhile, infighting among Wurche’s people threatens to leave the region exposed to powers much larger than themselves. 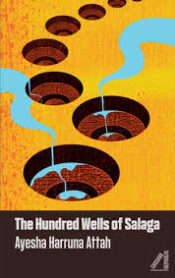 The Hundred Wells of Salaga explores the depths of female friendships in this stirringly intimate reimagining of life in pre-colonial Ghana. This captivating novel establishes Ayesha Harruna Attah as one of the most distinctive voices of the contemporary literary scene.